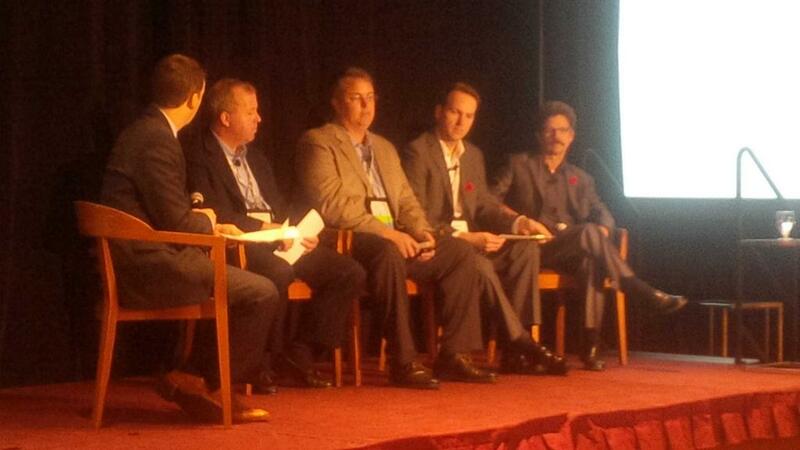 On Tuesday, I participated in a panel at the Canadian ISP Summit in downtown Toronto. The summit is run by the Canadian Network Operators Consortium (CNOC), and brings together Internet service providers large and small from across the country to discuss important issues and emerging opportunities. While an extremely busy schedule unfortunately prevented me from catching much of the summit, I enjoyed my brief visit and hope to return next year. Hopefully the folks in the crowd enjoyed our panel and found it worth their attention. I always enjoy a good panel, whether participating or observing, so I was quite excited upon receiving the invitation a few months ago. The panel was moderated by Matt Stein, the CEO of Canadian ISP Distributel, and he and his assistant Kristine did a great job syncing up with the panelists in the weeks leading to the show. Panels are an interesting thing: you typically have a moderator, and then between three and five panelists (although here’s one with seven! ), with the moderator guiding the discussion to make sure many topics are covered and no panelists ‘take over’ and bogart the mic. Because of all these moving parts, panels can range from terrible (e.g., a weak moderator and panelists who just try to repeat sales pitches) to fantastic (e.g., a strong moderator and skilled panelists who are willing to have a lively discussion). In our case, Matt did a terrific job of keeping the topics flowing and making sure each panelist was heard from. As a panelist, I love the format. Sometimes you’re put right on the spot and have to think and speak concurrently, but other times you’re the third or fourth person to answer, so you’ve had a minute or two to prepare. Personally, I pay close attention to what my fellow panelists are saying, and I even have a little pad of paper on which I take notes. This keeps my focus, prevents me (to some extent) from making odd facial expressions when I hear something that I think is ridiculous or someone gets salesy, and lets me relate my own answers to those which have already been delivered – whether I’m in agreement or I see things differently. My approach to being a panelist is, basically, to know the topic inside and out; that way, I can answer questions without having to revert to one or two stock responses. Perhaps it is simply youthful naivete, but I’m genuinely interested in an open, honest discussion, and I always want to get better. As is my tendency, I was very much over-prepared. The topics, in general, were known ahead of time, but you never know for sure where the discussion will go; plus, with questions from the audience, anything can happen. Consequently, I thoroughly reviewed Canadian Internet usage statistics, the Canadian regulatory environment, and commercial and technical considerations for Internet traffic management, to name just a few subjects. Thanks to my job, I always have a good working knowledge of global Internet trends, so that didn’t need any additional cramming. Our session was 40 minutes long, and – my goodness – it flew by. I really would’ve liked for it to be much longer. We covered a range of subjects, but not nearly all of them, and from what I could tell we held the audience’s attention. As I said earlier, Matt did a great job moderating, so I think we all had roughly equal time. Throughout, I was studying the audience and listening carefully to my fellow panelists, and I noticed that we each had a very different presence and approach. A panel’s only as good as the panelists, and I think we were collectively a solid bunch, so thanks go out to Ian Hood, John Priest, and Bill Basquin, and again to Matt for pulling the grou together. Each of my co-panelists works for a direct competitor (booo! ), but they seemed like decent guys. As an aside, with all the recent municipal elections, I was reminded of mayoral debates and such in which people are lined up alongside their competitors. This was kind’ve the same thing, but without the petty name-calling. I certainly hope to return next year! Our session was 40 minutes long, and it flew by. I really would’ve liked for it to be much longer.